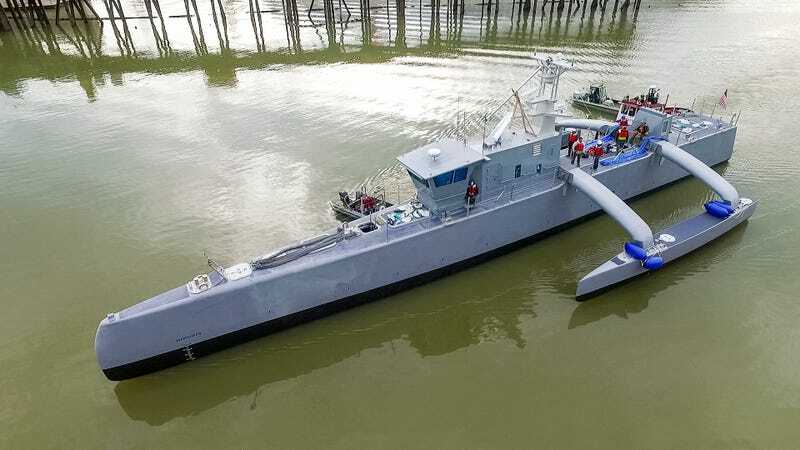 DARPA recently christened its brand new Anti-Submarine Warfare Continuous Trail Unmanned Vessel (ACTUV). The autonomous vessel can travel on the high seas at speeds up to 27 knots for months on end without a single crew member. The 130-foot ACTUV can be remote-controlled, but its primary use is as an autonomous vessel that can operate safely near manned ships and accommodate all weather conditions. No crew means greater safety for potentially dangerous missions like countermining and submarine tracking. ACTUV is now slated for joint testing in open water between DARPA and the Office of Naval Research to determine viable payloads and potential uses for this sub-hunter robot. Watch below for a time-lapse of its construction and some maneuverability tests on the ACTUV.